Preheat the oven to 350°. Spread the chestnuts on a baking sheet and bake until slightly dry, about 5 minutes. Let cool, then thinly slice and transfer to a large bowl. Bring a large saucepan of salted water to a boil. Add the haricots verts and cook until crisp-tender, about 5 minutes. Drain and cool under running water. Pat thoroughly dry. Add the beans to the chestnuts. In a blender, combine the shallots, cider vinegar and oil and pulse until smooth. Add the dates, thyme and 1/4 teaspoon of pepper and pulse until the dates are finely chopped but not pureed. Add the dressing to the beans, season with salt and toss. Serve at room temperature or chilled. 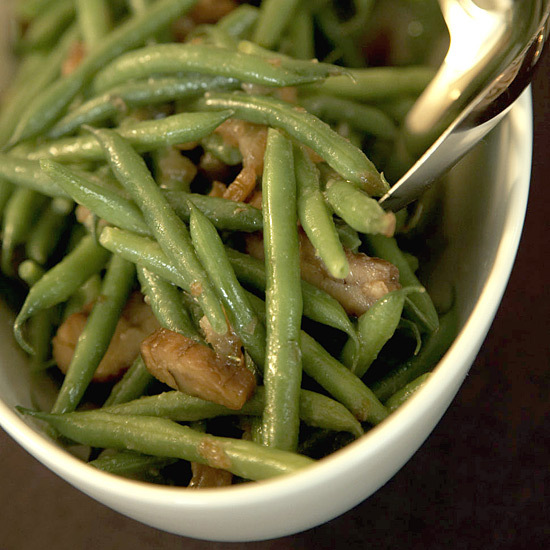 The cooked haricots verts and dressing can be refrigerated separately overnight.